Maharaja is derived from the sanskrit words mahat, meaning “great”, and rajan, meaning “king”. Much like its namesake, this imperial IPA is regal, intense and mighty. With hops and malts as his servants, he rules both with a heavy hand. 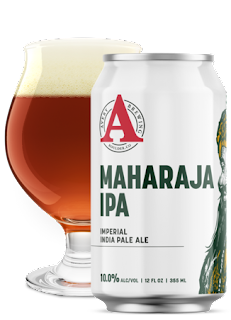 The Maharaja flaunts his authority over a deranged amount of hops: tangy, vibrant and pungent along with an insane amount of malted barley – fashioning a dark amber hue and exquisite malt essence. Welcome to his kingdom!